Upload a poster depicting the science and approach of the Consumer Awareness Curriculum. 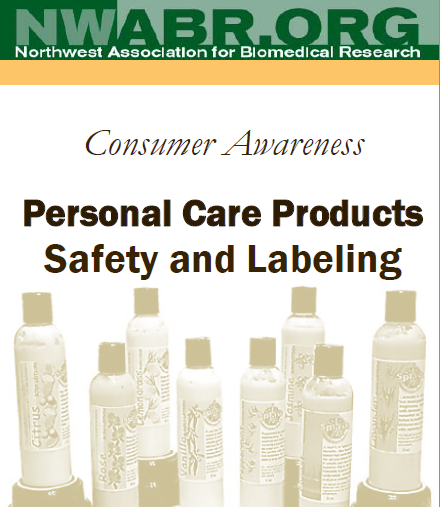 A lotion kit loan program for trained teachers and a lotion-making workshop for the community are available through the Science and Math Institute (SAMI) at Bellevue College. The kit loan program and the workshop were originally developed and delivered by NWABR. Description: This is the description for lesson one. Teachers who have received professional development training for the Consumer Awareness curriculum are invited to participate in the lotion kit loan program. The 3-tub “kit” with equipment for 8 lab stations (that can accommodate up to 32 students at one time) and sufficient supplies (lotion ingredients and containers) can be reserved for up to two weeks. Teachers are responsible for picking up and returning the kit to Bellevue College. Schedule a fun, informative lotion-making workshop for class, science club or afterschool activity for middle or high school students, or for adult organizations! Explore labels, analyze claims, learn some basic chemistry and make a lotion with fragrances of your choice! The workshop will be presented by a trained volunteer from Bellevue College. Bellevue College will provide the equipment and supplies for up to 32 workshop participants. The workshop can be scheduled for 1.5 or 2 hours at your location within the greater Seattle area. There are some facility requirements (table space and electrical outlets). A fee may apply, depending on the number of participants. For more information about these programs, their fees and scheduling,please contact Jenn Pang, PhD, Director of SAMI, at jennifer.pang@bellevuecollege.edu. A list of online MSDS Resources is available under the links tab! Additional 'Resources' are available for each lesson within the actual word document. This tab will continue to be updated, but until then please utilize the resources within each lesson!